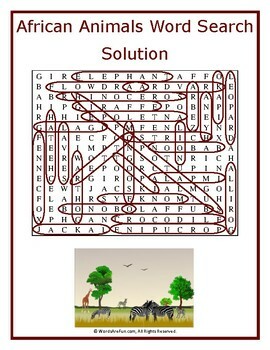 A word search puzzle featuring words associated with African animals. 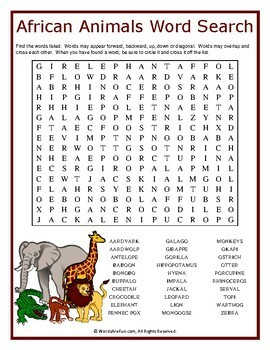 This is the perfect word search to help students learn about some of the animals living in Africa. Use this sheet as part of your teaching curriculum, a treat for early finishers or just for fun. Word List: Aardvark, Aardwolf, Antelope, Baboon, Bonobo, Buffalo, Cheetah, Crocodile, Elephant, Fennec Fox, Galago, Giraffe, Gorilla, Hippopotamus, Hyena, Impala, Jackal, Leopard, LIon, Mongoose, Monkeys, Okapi, Ostrich, Otter, Porcupine, Rhinoceros, Serval, Topi, Warthog, Zebra.